The James Bond movies have always been known for epic action sequences that typically open each film in the franchise, the most recent of which, 2015’s Spectre, takes place at fun looking Day of the Dead (Dia de los Muertos) parade happening in Mexico City. The most surprising thing about the scene is that this parade was created entirely for the production and was not a real annual event, until this year when city officials decided they needed to make it a reality for the good of tourism gained from the exposure in the movie (which opened on November 6, 2015), and a new tradition has now been born. As Atlas Obscura explains, “Mexico City fought hard for its eight minutes in Spectre. Leaked documents show that Mexican officials offered Sony Pictures millions of dollars in tax incentives in exchange for featuring the capital city in the Bond film. Sony Pictures even let Mexican authorities make certain changes to the script, including featuring a major Mexican actress, Stephanie Sigman (pictured below), as the ‘Bond girl’ in the parade scene and making the villains another nationality than Mexican. Stephanie Sigman stars in ‘Spectre’. “There was only one problem: the tradition depicted in the movie was completely made up. There are many traditions across Mexico that are associated with Day of the Dead, but a parade through downtown Mexico City has never been one of them. “Bringing Bond to Mexico City was part of a project to promote the capital as a major tourism destination. “However, Mexico’s tourism authorities began to worry that tourists who have seen Spectre might come to Mexico City expecting a parade like the one they saw in the movie, and be disappointed to find that it doesn’t exist. In order to take advantage of all the exposure they had gained from Spectre, they would need to invent a new tradition. “So, on Oct. 29, 2016, Mexico City hosted its first-ever Day of the Dead parade. With over a thousand participants, including professional dancers, choreographers and visual artists, and dozens of floats and giant sculptures for the first edition, the parade aims to attract hundreds of thousands of visitors to Mexico City in the future. Torruco Marqués said that it could even compete with the Rio de Janeiro Carnival for the title of the world’s biggest parade. “The event was presented as a showcase of diverse Day of the Dead traditions and art from around Mexico. It also got some more use out of the costumes and props from Spectre. “From a tourism standpoint, the event was a success: attendance was higher than anyone expected, and attracted many foreign visitors. City government estimates say that 425,000 people lined the streets. “However, many Mexicans are offended by the government’s enthusiastic support for an invented ritual based on a Hollywood movie. Magaly Alcantara Franco, a student at the National School of History and Anthropology, believes the parade was influenced more by potential tourists’ perceptions of Mexico than by Mexican traditions themselves. 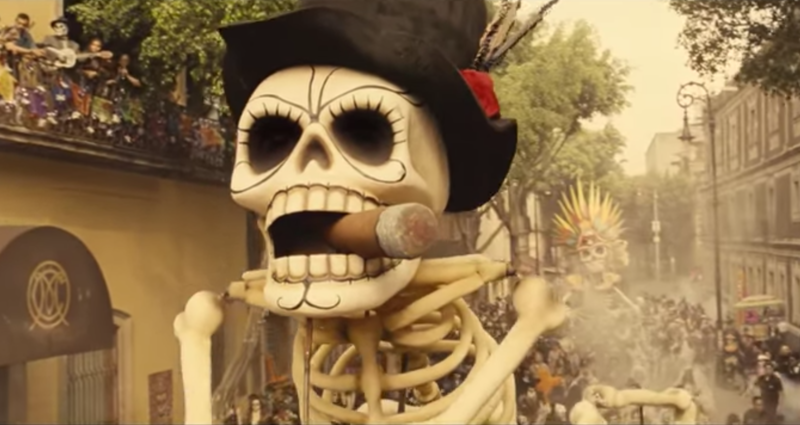 You can watch the amazing opening tracking shot featuring the Day of the Dead (Dia de los Muertos) Parade in Mexico City from Spectre below! ← Watch Apple’s Haunting, Heartwarming Frankenstein Christmas Commercial!